Where do I use my National Trust Online Shop voucher code? Copy a code from our website and head over to the National Trust Online Shop website. Browse for your items and click ‘Add to basket’ on the things you want. Once you’re finished click ‘Checkout’. On the ‘Your basket’ page you’ll find a ‘Promotion code’ box underneath your items. Paste your code into here and click ‘Update’ to enjoy your savings’. "10% off when you sign up." The National Trust looks after the welfare of small and ethical business by making sure they maintain a sustainable business. To support this, the group offers the promotion and retail of these products in The National Trust Online Shop which aids them in receiving due recognition and considerable profit. The National Trust Shop has a superb garden and outdoor category that supplies you with all your possible garden needs. National Trust Shop Garden Furniture is available at affordable prices for all manner of gardens- big or small. You can find decorative garden furniture such as sculptures, decorative accessories, outdoor lighting, sheds and summer houses. You can also find bird feeders and bird and bee boxes if you have a passion for wildlife and like your garden to be thriving with nature. You'll also find a garden sale were hundreds of garden furniture products are discounted and reduced to save you money on your purchase! The National Trust Online Shop holds plenty of great sales throughout the year. You can find seasonal sales and end of season sales as well as numerous offers and deals that'll help save you money. The National Trust Online Shop sale features a wide range of wonderful, discounted items including final reductions that are only available for a limited time only. 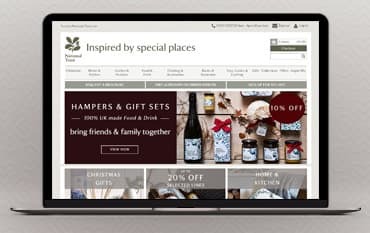 Find arts, crafts and design products, umbrellas, rugs, alcohol, chocolate, hampers, books, aprons, plant stakes and hundreds of other products in the diverse sale section at The National Trust Online Shop. UK delivery is £4.95 and free on orders over £50. National Trust Online Shop will offer you full returns on products returned in a resalebale conditon 30 days after purchase. If you need to contact National Trust Online Shop please call 0300 123 2025. National Trust Online Shop sells a huge range of gifts for your home and garden. Grab a National Trust voucher code and make a fabulous saving on kitchen ranges, books, environmental and gardening ranges. Not only will you be sure to find some great gifts, but 100% of profits go towards looking after National Trust’s treasures.